We are currently accepting applications and encourage you to read through the Eligibility Section before beginning yours. Welcome to the fifth edition of the President’s Report. In this edition I will highlight some of our recent accomplishments and aspirations. To learn more about the Beveridge Family Foundation, please visit www.beveridge.org. Descendants of Frank Stanley Beveridge should be sure to read the “Bev Bucks“ section near the end of this report. Pioneer Valley non-profits won’t want to miss the final Alternative Funding Workshop of the year. Info and registration is below in the Alternative Funding Initiative section. At the October 2018 Board meeting, we authorized $666,500 in grants to a variety of organizations in Western Mass. This brings the total grants for the year to $2,224,103. Following is a list of the recent grantees with links to their websites so you can learn more about our wide variety of interests and the outstanding work done by these dedicated organizations. In February 2018 the Beveridge Family Foundation, Inc. (â€œthe Foundationâ€) conducted a survey of prior grant applicants. 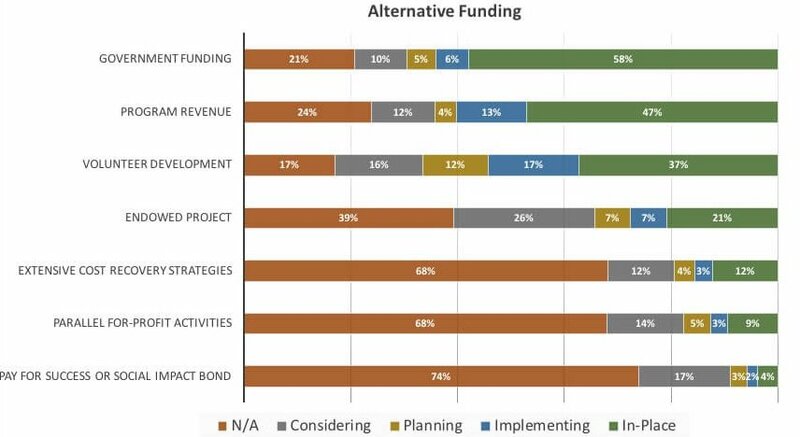 The topic of the survey was alternative funding streams. Out of roughly 400 valid email addresses, 190 responses were received. A brief review of the results follows. I applaud Massachusetts State Senator Eric Lesser on his efforts to promote high speed east-west to connect Boston and Springfield. The legislature has repeatedly approved funding for a study and it is consistently vetoed in order to protect lucrative bus routes. I feel strongly that it is short sighted to reject the high speed rail project. The need to connect Springfield and Boston is compelling, not just for Springfield, but for Boston, and the long term viability of the entire state as an economic engine. Welcome to the second edition of the President’s Report. It’s been a busy six months since the last report of the Beveridge Family Foundation. In the following pages, I hope to share our progress. Descendants of Frank Stanley Beveridge should be sure to read the “Bev Bucks” section near the end. As of April 30, 2017, the investment value of the Foundation was $55,710,723, up 3.6% since the previous report at the end of August 2016. The assets remain prudently invested among common sectors under the guidance of UBS. Welcome to the first President’s Report of the Beveridge Family Foundation. This report is designed to inform friends of the Foundation of highlights from the past six months. As of August 31, 2016, the investment value of the Foundation was $53,778,327, up 1.8% for the year. The assets remain prudently invested among common sectors under the guidance of UBS. As a Foundation, we contribute 5% of our assets each year to approved charities. Governance is overseen by a board of thirteen directors, consisting of ten family and three non-family members. Day-to-day operations are managed by the President, with assistance from GMA (bookkeeping), Edelstein, (auditors), Kenneth Wenzel (retained counsel), and Tim Turner (web programmer). To date in 2016, we have awarded 60 discretionary grants totaling $267,000, 29 general grants worth $502,000, and provided monthly support amounting to $530,000 to The Stanley Park of Westfield, Inc.